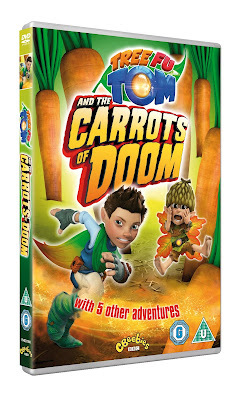 Tree Fu Tom and the Carrots of Doom - how could we possibly resist a DVD with a name like that? Lara (6) and Holly (3) very rarely agree on a television show that they would both like to watch but Tree Fu Tom seems to perfectly bring together their two age ranges and they were excited to hear that Tree Fu Tom and the Carrots of Doom is released this week on DVD. As is the norm, both girls spent most of the time watching this DVD while stood up in the living room so that they were ready for action as soon as Tree Fu skills are required. I love this interactive part of Tree Fu Tom which encourages kids up and out of their seats to get active. The Carrots of Doom is just one of six episodes on this DVD (132 mins in total). In the title episode, the Tree Fu Rangers have to harvest some enormous carrots that have grown too huge; the team use some ingenious inventions and work together to solve the problem. The gardening theme runs through quite a few of the episodes - Lara and Holly most enjoyed the episode, Range Tom : A Badge Too Far in which the rangers are competing to try and get more badges than each other. I think this really appealed to Lara now that she is in Beavers and is trying to earn badges of her own. There is an important lesson in this show that trying to cut corners and do too many things as once can often result in nothing being done very well at all. The last episode on the DVD has a Christmassy theme so we are saving that one for watching a little closer to the time to find out about the Tree Ranger's Winter Fest. The girls both enjoyed this DVD - the mix of nature challenges, Tree Fu skills, mild peril, silly stinky mushrooms and collectors badges captures the imagination of both girls and boys from age 2-7. Tree Fu Tom and the Carrots of Doom is out now on DVD by Freemantle media and costs around £6.